By making it meaningful and relevant to the family – the Bat Mitzvah experience is transformed. It excites me that people are making the experience less of a blow out party and more of a meaningful family journey. It is my honor and pleasure to officiate a Bat Mitzvah for any family in the destination of their choice! 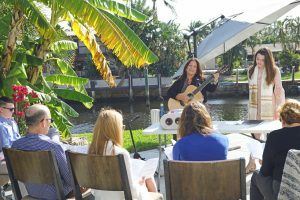 Katie’s family chose a beautiful location on a South Florida premiere canal location with a beautiful Airbnb home rental. Because they had 8 people in their family, that would have required 3-4 hotel rooms. For much less cost, they were able to secure this beautiful home in Lighthouse point, and had the Bat Mitzvah ceremony there, out on the water. Katie’s grandmother lives here in South Florida, and didn’t feel comfortable flying up north in the winter. Since the family does not belong to a synagogue, they hired a local Bat Mitzvah tutor in their hometown. 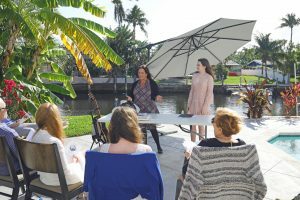 They contacted me to express their dream of having a Bat Mitzvah with just the family here in South Florida. They were so thrilled to know their dream could absolutely come true! It was more important to Katie’s family to have this celebration together with the people that meant the most to them, and that is what I love to do! 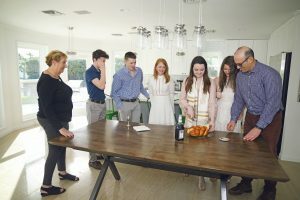 Making family the focus highlights the beauty of the Jewish experience! Bat Mitzvah Tutoring – Let’s get to work! Katie’s tutor and I collaborated to make sure we were all on the same page for chanting prayers and her tutor did a great job! Katie and I actually didn’t even get to meet till 1 hour prior to the Bat Mitzvah service, but it all went so well! Obviously, you can see from the photos – the group was small, but the impact was BIG! Katie’s Destination Bat Mitzvah was everything this family hoped for. 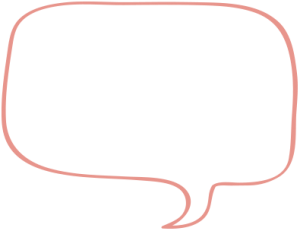 Katie read from the Torah, shared her personal thoughts on becoming a Bat Mitzvah, as well as the meaning of her Torah portion – Bo, from the Book of Exodus. The weather was indescribably perfect that day! Katie’s delivery and intention was too, and I so loved spending the day with this lovely family.